The writer of The FADER’s Zayn Malik cover story talks about his time in Zayn’s backyard, and what it’s like to interview someone this beloved. 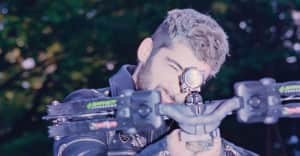 Those show and tell a lot about The FADER deputy editor Duncan Cooper's experience meeting Zayn—you can see Zayn's gameness not just to speak candidly but to pose shirtless on his motorcycle, and read about his generosity in letting us come to his house. But for anyone still curious what was it really like meeting Zayn, this short video offers a little more about the writer's side of things, and some bits that didn't make the story's final edit: Zayn's love of Bob Marley, and an unusual gift from his old band. For more wild Zayn interactions, check out U.K. rap duo Krept & Konan's story about the time Zayn casually let them borrow his plane. Order a copy of Zayn's issue of The FADER.